The Chronicle of Mathew Paris, a monk of St. Alban’s Abbey, records under the year 1250, the story of Bishop George, who was the leader of a group of Armenian fugitives who fled from the Tartar invasions. He died in the town of St. Ives and was buried next to St. Ivo’s spring and soon after, as proof of his holiness, began to perform miracles. These Tartar invasions extended over a twenty year period as the Mongol Golden Horde, under the grandsons of Genghis Khan, swept across Eastern Europe, conquering the Slav principalities of Kiev and Vladimir and threatening the Eastern European kingdoms of Poland, Hungary, Serbia and Bulgaria. They were characterised by their brutality and left behind great pyramids of skulls as a witness to destruction. Now, more than seven centuries later, a similar terrifying army, the self-proclaimed Islamic State, has been threatening those defenceless souls, who are surviving vestiges of Christianity from their ancestral homelands, and driving all before them in terror and panic. The momentum of this tide of dispossessed humanity, once again, is lapping on our shores. Nor can we overlook, even as in 2015 we marked the centenary of the Armenian Genocide and the Syriac Sayfo, where millions were martyred, that the fragile remnant which remained is still being systematically effaced. The long tradition of hospitality, shown by Great Britain, is being pushed to its limits, but the compassion of the British public is reaching out with its traditional generosity when confronted with the harrowing images of human suffering and tragedy. Among these “poor, huddled masses, yearning to breath free, this wretched refuse of the teeming shore, these homeless, tempest tost,” – I quote from the words inscribed on the Statue of Liberty – are large numbers of Orthodox Christians. Eritreans and Syrians from the Oriental Orthodox family as well as assorted Eastern Europeans from the Eastern Orthodox tradition who come as economic migrants. In the past two decades, the Orthodox Christian population in the United Kingdom has probably quadrupled and the efforts of their mother churches, previously confined to chaplains attached to their respective embassies, have been stretched to the limit in their efforts to minister to them spiritually. The current estimate of the Orthodox population currently here is 354,000, although generally their regular attendance at services is low or limited to the great feasts. Although the two families of Orthodox are not in communion with each other, the general tendency is for the clergy of both sides to admit them as occasional communicants. This pastoral response transcends the canonical boundaries and reflects the fact that a strong measure of theological agreement has already been reached between them. By 1994 the Joint Commission had made huge steps towards reunion and was already discussing means by which the lifting of anathemas and condemnations of the past might be achieved. It was clearly stated that the lifting of the anathemas should imply the restoration of full communion on both sides was to be implemented. The Coptic Orthodox Church, encouraged by the late Pope Shenouda, played an active and committed role in this dialogue and, at that date there was a sense that this would be fulfilled soon. Already there had been tentative moves towards the desired consummation. In November 1991 the Greek Orthodox Church of Antioch issued a Synodal and Patriarchal Letter speaking eirenically of the Non-Chalcedonian Patriarchate of Antioch as its “sister Syrian Orthodox Church”, refusing to receive members from it; and authorising mutual participation of clergy at baptisms, weddings and funerals. In 2001 a Pastoral Agreement on mixed Christian marriages was agreed between the Greek & Coptic Patriarchates of Alexandria. I am, however, saddened to find that some of the Orthodox clergy in the UK are not inspired by this vision of unity and still regard Oriental Orthodox at worst, as tainted by Monophysitism or at best, stubbornly intransigent about accepting the later councils. They are usually poorly informed about history and Christology but can always find champions of their position among Athonite diehards and their disciples. Sadly, this most significant of all ecumenical dialogues, appears to have stopped completely. In 2000, Father John H. Erickson wrote, “In the course of the last decade, the impulse towards reunion of the churches has slowed. Articles published in the late 1980s and early 1990s, soon after the Joint Commission issued its agreed statements on Christology, could speak optimistically of ‘recent strides towards reunion’ and ‘last steps to unity.’ Since then, however, progress has slowed considerably.” As he enumerated some of the emerging hostility to reunion, across both families, Father John observed, “The question at this point is whether we really desire unity more than our present disunity. Will we continue to be divided simply by the power of division itself? Certainly at the present time we seem to prefer the disunity to the status quo. Our cherished anathemas and preferred formulas give us a sense of security. Without them, our very identity seems threated.” Nineteen years later, the situation is unchanged. A tragic, but potent symbol of this desired reunion, is the image of the two kidnapped Orthodox archbishops of Aleppo, Mar Gregorios Youhanna Ibrahim and Metropolitan Paul Yazigi, who were kidnapped together in April 2013. Typically, both bishops were united in a humanitarian mission, it has been said to negotiate the freedom of a kidnapped Armenian Catholic priest. 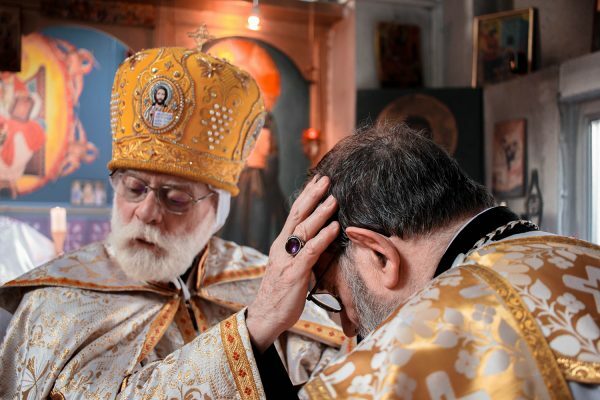 They have not been heard of since, but they are prayed for regularly in British Orthodox Churches and in many other churches around the world. I knew both bishops personally. I first met Metropolitan Paul when he was staying in the UK to improve his English and he stayed in touch exchanging Paschal and Christmas greetings. I stayed with Mar Youhanna in Aleppo; we met each other often and he dined with me at my club in London only a few months before he was taken. It is to be lamented, however, that whilst support for the Dialogue has powerful and committed backers among Orthodox hierarchs, there are others on each side of the two families who work to frustrate the process, believing that they are the true champions of Orthodoxy. Their intransigence has effectively prevented reunion moving towards its logical fulfilment. Orthodox ecclesiology still maintains the principle of the primitive church, which is the rule of one bishop in one city, although in Great Britain it as widely ignored, as elsewhere in the lands of the diaspora. In reality Orthodox bishops preside over jurisdictions based entirely on ethnicity rather than territory, which is a complete departure from the canonical norms of the Orthodox Church. Although there are fraternal exchanges and occasional ecumenical gatherings, each jurisdiction is very much self-contained. In some cases the bishop with jurisdiction is not actually resident in the UK, so contact with him is infrequent. Small though it is, the British Orthodox Church, is a true local church and not a diaspora ministry from a mother church elsewhere. 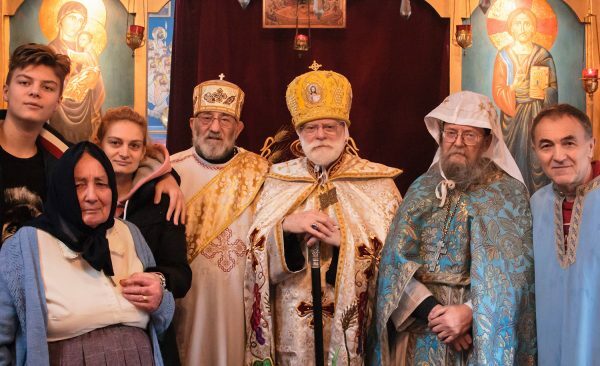 The British Orthodox Church already transcends this divide between the two families, with Orthodox from many jurisdictions worshipping among British-born converts and having both clergy and worshippers from Greek, Russian, Roumanian, Eritrean, Ethiopian & Egyptian heritage. Reaching out to these displaced Orthodox and attempting to respond to this and other developments and the changing dynamics taking place in the Middle East and Britain is one of the challenges to our ministry for which, being a truly local church, we are best suited. “New Colossus” by Emily Lazarus. Father John H. Erickson, Beyond Dialogue: The Quest for Eastern and Oriental Orthodox Unity Today, Symposium on 1700th Anniversary of Christian Armenia (2000). 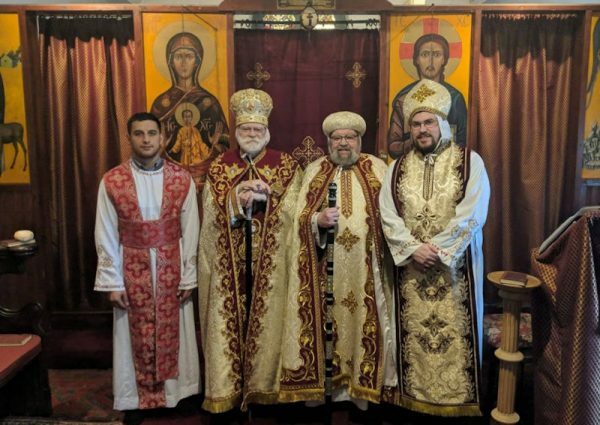 On Sunday, 17 February 2019 Deacon Antony Holland of Portsmouth was ordained as the new Archdeacon of the British Orthodox Church (Metropolis of Glastonbury) in succession to the late Archdeacon Mark Saunders, who died in November 2018. Deacon Antony had deputised for the Archdeacon Mark when visiting Babingley on 4 November, just three weeks before his repose. Archdeacon Antony is the sixth Archdeacon to serve during Abba Seraphim’s pontificate and was ordained as a Deacon for the Bournemouth Church in February 2014, having been a member there since 2010. The British Orthodox Church is in direct historical continuity with the mission of Julius (Ferrette), Bishop of Iona (1825-1904), who came to the British Isles “as a bishop consecrated for a Western Mission by one of the Eastern Churches.” Anciently the only Primates to be called Patriarchs were the bishops of the five historic sees of Rome, Constantinople, Alexandria, Antioch and Jerusalem, but in the course of time (and especially during the twentieth century the primates of the newly independent churches of Russia (1589-1720, revived in 1917), Roumania (1925), Serbia (1920) and Bulgaria (1946) assumed Patriarchal rank, whilst Britain did so towards the end of the nineteenth century. “1. The British Church was founded by the Apostles and Apostolic Missions A.D. 49 – four centuries before the Foreign Roman Papal Church was founded in Kent by Pope Gregory and St. Augustine – fifteen centuries before the present State Church was established by Henry VIII. His successor, as second British Patriarch (1889-1917), was Charles Isaac Stevens (1835-1917), who was style Mar Theophilus “Archbishop of Caerleon, Caertroia, Verulam, &c.; and Patriarch ŒC in the Church of God” but was also referred to as “Abp. Stevens, Pat. British Church”. The third British Patriarch (1917-1919) was James Martin (1843-1919) who also held the see of Caerleon-on-Usk and was styled “Mar Jacobus Antipas, Archbishop and Patriarch”. His successor, as fourth British Patriarch (1919-1922) was Andries Caarel Albertus McLaglen (1851-1928), who styled himself as “Archbishop and Patriarch of the Ancient British Church” but retained the see title of Claremont, to which he had been originally consecrated rather than adopting that of Caerleon. His successor, Herbert James Monzani-Heard (1867-1947), styled Mar Jacobus II, also retained his original see title of ‘Archbishop of Selsey’ when he became the fifth British Patriarch in 1922 upon the abdication of Mar Andries. It was Mar Jacobus II, in his capacity as Fifth British Patriarch, who was responsible for promulgating “The Statutes of the British Patriarchate” on 9 September 1943, which have been one of the constitutional foundations of the British Orthodox Church for the past 75 years. In 1943 Mar Jacobus II abdicated in favour of Mar Georgius I, Archbishop of Glastonbury (1905-1979), who upon succeeding attached his rank to his episcopal see by using the style “Patriarch of Glastonbury”, but in 1969 reverted to the style of ‘Metropolitan of the Holy City of Glastonbury, the Occidental Jerusalem, and Sixth British Patriarch’. On 6 April 1994 Abba Seraphim (as he was now styled) and the late Pope Shenouda III jointly signed a Protocol defining the relationship between the Orthodox Church of the British Isles (the former title of the British Orthodox Church) and the Coptic Orthodox Church. On 16 June 1994 – three days before his formal consecration as Metropolitan in Cairo –– having ceased to exercise his Patriarchal office out of courtesy to Pope Shenouda, but desirous to make provision for the preservation of the British Patriarchate as an ecclesiastical and historical jurisdiction, and in order to prevent specious claimants asserting claims thereto; as well as providing for some future eventuality when it might be revived by due and canonical authority for the good of the British Orthodox Church, Abba Seraphim placed the office of British Patriarch into commission. Vide Abba Seraphim, Flesh of Our Brethren. An historical examination of Western episcopal successions originating from the Syrian Orthodox Patriarchate of Antioch (British Orthodox Press, London: 2017). British Orthodox Church archives, Addit. Mss 7(i)/3. Mar Ignatius Peter, Ignorance is Bliss. The Historical Evidence for the British Patriarchate, (Metropolitical Press, Glastonbury: 1985). “An Act of the Holy Governing Synod proclaiming the Lawful & Canonical Succession of His Beatitude Mar Seraphim I to the Apostolic Throne of Glastonbury”, Glastonbury Chartulary, Vol. I, 1. (3 March 1979); “Memorial concerning the Solemn Enthronement of His Beatitude Mar Seraphim I as Metropolitan of Glastonbury & Seventh British Patriarch”, Glastonbury Chartulary, AS Vol. I, 14 (11 August 1979). “Protocol determining the relationship of the British Orthodox Church of the British Isles (BOCBI) to the Coptic Orthodox Patriarchate of Alexandria”, Glastonbury Chartulary, AS Vol. XVI, 2 (6 April 1994). The Glastonbury Review, No. 127 (December 2017), p. 9. “Decree concerning the Restoration of the British Patriarchate”, Glastonbury Chartulary, AS Vol. XL, 25, 23 December 2018). “I have not said to Jacob’s descendants ‘seek me in vain’. I the Lord speak the truth; I declare what is right”. “And they continued stedfastly in the apostles’ doctrine and fellowship, and in breaking of bread, and in prayers”. This is why the traditional Christian churches study the Scriptures with respect, noting the comments of the saints and fathers of the church (patristic study) which generally demonstrates a consensus of understanding, which the Church upholds as truly representing the “mind of the church.” Just as it is believed that God revealed Himself through the written word revealed to holy men, so our Lord Jesus Christ, as God incarnate, is the Living Word. As early as the second century St. Irenaeus condemned a number of Christian sects which transmitted their teachings only to a limited circle of initiates, claiming that through various esoteric rites they would have access to a deeper knowledge of God. For them knowledge (gnosis) rather than Faith was at the core of their religion. It is quite clear from the Scriptures and from the words of our Lord at His trial that He repudiates the concept of esoteric teaching because the goodness and mercy of God is available to all who submit to the grace and guidance of the Holy Spirit. The whole concept of secret teaching and an élite group of initiates who are possessed of what they falsely call ‘knowledge’ runs totally contrary to the outpouring of grace made available to simple souls who embrace their Creator with true love and devotion. The Gospel of God is intended for each and every man and woman, without restriction and without distinction of education, degree or status. During the weekend of 22-23 December, Metropolitan Seraphim, accompanied by Father James, visited Abba David and the Church in Cusworth, Doncaster. On Saturday, 22 December Abba Seraphim presided over a clergy meeting and during the Raising of Evening Incense, Father James made his monastic profession in the presence of Abba David, who conferred the monastic tonsure and Abba Seraphim who admitted him to the ‘Monastic Brotherhood of Glastonbury of the Syrians’ and clothed him with the Little Monastic Habit. On the Sunday morning, Abba Seraphim concelebrated the Divine Liturgy with Abba David & Fr. James, assisted by the newly ordained Subdeacon Vladimir Roze, after which a pastoral visit was paid to a local care home to take communion to Mrs. Hazel Rockliffe, a long-standing member of the Cusworth congregation.